[SatNews] Spanish satellite communications operator HISPASAT has initiated the second generation 4K TV transmissions using High Dynamic Range (HDR) format. The goal of this new technology is to reproduce a wider luminance range, creating more intensity levels between lighter and darker areas of the image as a way to retain more information and offer a greater degree of detail, providing more brightness, greater contrast and more color, in order to achieve a more realistic image than we currently have in television. 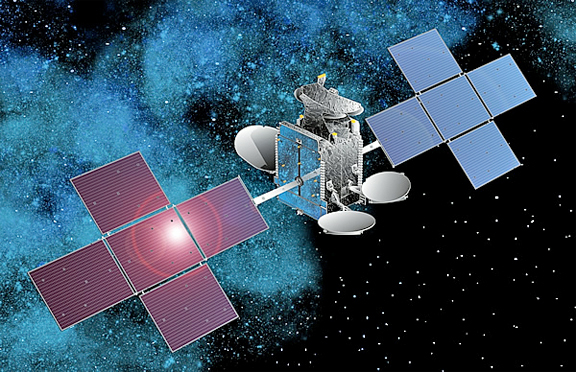 Artistic rendition of the HISPASAT 1E satellite. Image is courtesy of HISPASAT. The new permanent service is now available through the European beams of Hispasat 1E satellite and has been launched in collaboration with Cellnex Telecom, Dolby, RTVE and Thomson Video Networks. This new step forward shows HISPASAT’s commitment to remain at the cutting edge of Ultra High Definition television technology and complements its “Hispasat 4K” channel, which has been active since 2013. This innovative milestone, the first in the satellite world using Dolby Vision HDR encoding, will be presented at upcoming fairs where HISPASAT will be participating, the first of which is the International Broadcasting Convention (IBC) held in Amsterdam from September 11 to 15, 2015.